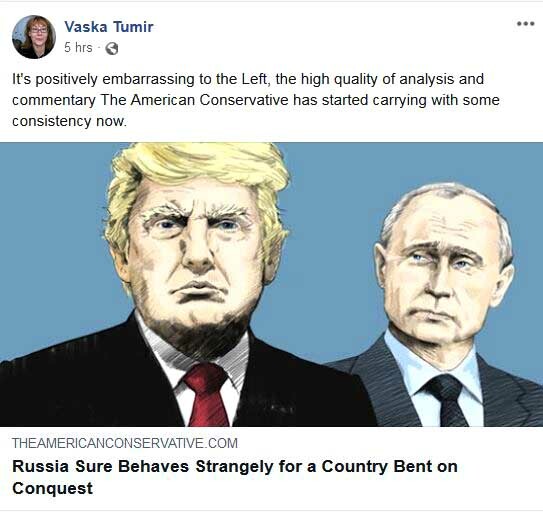 For the second time in three days I’m indebted to OffGuardian editor Vaska. Her FB posting of a cringeworthy example of Israeli hasbara prompted my post: Breast cancer, feminism, Israeli warplanes. Here again is the full article by Ted Carpenter. The Left has ceded to lone wolves on the Right the terrain for challenging a demonisation thoroughly internalised by liberal audiences. That not only green lights the very scary road our self-serving rulers are taking us down, but leaves an explanatory vacuum. One that has been filled from the Right: partially and inadequately, yes, but be thankful for small mercies. Just as Mail maverick Peter Hitchens, with his demands for evidence – and for answers as to why in God’s name Assad would gas Syrian children to no conceivable gain the week UN weapons inspectors arrive – show up the painful prejudices of Monbiot and Jones, so does Carpenter’s take-down of Russophobia shame not just the Luke Hardings of this world but the entire Democrat machine, its pet media and, this side of the pond, BBC, Guardian and pretty much all wings of the British Labour Party. I’ve objected before to the tendency of far left groups in the West to assert without a shred of evidence, far less what Marxists used to call materialist analysis, that Russia is ‘imperialist’. I’m obliged to Roger “Socialist in Canada” Annis for pointing out that not only is there zero evidence for so complacent a reading – a wonderful excuse for playing Pontius Pilate as NATO creeps eastward and Syria is devastated by Western interventions covert and overt – but that there is ample counter evidence. See the excellent eight-thousand worder Roger co-wrote with Renfrey Clarke on this facile trope. Thanks for this, have reblogged and will visit OffG and Roger/Renfrey via link. You may have read it before Susan – I think it came up in a past exchange – but it stands a second reading.